Sometimes online spaces can feel inauthentic. We encounter messaging that gives off bad vibes, language that feels icky, and an overall sense that something is just not for us. When creating our own space online we may wonder if we will come across this way too. The last thing we want to do is offer something that is not in alignment with our own higher vision. Our work is our soul journey, so honoring and protecting it is a high priority. The web does not have to feel cold. With the right approach, the web can be a portal for connection, a place for finding those who are in want and need of our offerings. There are many ways we can position ourselves to welcome those looking for the solutions we provide. Our websites can help us find and grow our communities. We can make them beautiful through design, colors, and imagery. These are important aspects of our web presence, but there are additional steps we can take to create the spaces online that feel just right. Below are a few ways we can be of service in a soulful way. The intention behind your website is your foundation for creating one. Use it as a meditation space before crafting your site. Your reasons could be as simple as taking notice of a need for a website. Perhaps the people you wish to connect with are not immediately within reach and you need a space where you and your customer/client can meet. Pssst! By the way, your social media account(s) are not enough. A website is an essential part of a business. Write what comes to mind as you sit with this question. Take a moment to sit with your intentions for creating your website. Having an intention is the starting point of clarity. 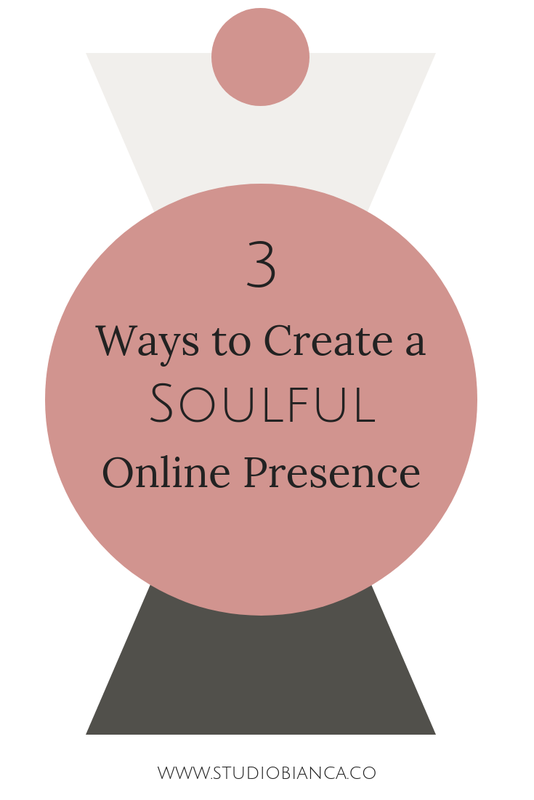 It will lead the way for discovering how you want people to feel while visiting your website. Bridge your website’s intention with your purpose and you’ll have an impactful web presence. Consider what you would like to achieve with your website. What actions do you want people to take when they arrive on your site? Would you like them to learn more about you? Do you want them to read your blog or learn about your local events? Is it your products or services you would like to share with them? Choose up to 3 actions you would like individuals to take when visiting your site. Doing this will help you organize your site. Words do more than help us communicate. They help us connect. The language used on our site shapes our messaging. Return to your goals and let these help guide you in selecting words that are in alignment with your business and your offering. It’s helpful to consider who you are trying to reach, too. Ask yourself who your ideal client is, who do you want to help, to serve. Also, consider words that resonate with your peeps. This step will probably be very easy since it is likely that the language you’ll use comes very natural to you, your friends, and community. Keep a list going of the words and phrases that resonate with you. When it comes time to writing the copy for your website, and really anything associated with your brand, you’ll be able to express yourself and speak for your business with ease. Try out the tips above and let me know how it goes. Getting clear about our online presence empowers us to own it. As creative entrepreneurs offering our unique perspectives to the world, being and feeling authentic is important to us, especially online. Our websites are invitations for others to get to know us and do business with us. Making our digital homes warm and welcoming is okay - we can use what works for us! When starting out, this might not be easy. This process can take time. We may come across others online who seem to have it all figured out but, I’m willing to wager that they didn’t start out this way. If this all doesn’t come together lickety-split, that’s okay. It will come eventually. Allow it all to unfold in its own time.